DINUBA – There is a housing shortage in every community in Tulare County. In Dinuba alone, the city will need to provide an additional 1,000 homes by 2023, according to the Regional Housing Needs Assessment conducted by the Tulare County Association of Governments. In other words, 138 new homes would be a good start toward reaching that goal. That’s the number of homes Visalia-based San Joaquin Valley Homes (SJVH) plans to begin building in Dinuba this month. Homes at Vista Robles in Dinuba will start in the $260,000s. San Joaquin Valley Homes (SJV Homes) and Presidio Residential Capital have acquired 40 acres north of Nebraska Avenue and east of Viscaya Parkway in Dinuba, California and plan to build Vista Robles, a new neighborhood with 138 single-story detached homes. The partners plan to break ground this month and begin model construction in February 2019. The retail value of this project when it’s complete will exceed $38 million. A SJV Homes model in Vista Robles. Vista Robles will offer single-story homes ranging from 1,443 to 2,100 square feet with Mediterranean, Tuscan and Craftsman exteriors. The three-to four-bedroom homes offer extra-large home sites and spacious floor plans with two- and three-car garages. Prices are expected to start in the $260,000s. This is SJV Homes’ 23rd joint venture project with Presidio Residential Capital, a San Diego-based real estate investment company that funds 100% of the projects and operations of SJV Homes. TULARE – Housing in Tulare County is one of the biggest problems facing the Valley’s economy. Economic Chris Thornberg says the lack of single-family home construction is concerning because it will mean higher overall prices for homebuyers. Garden homes in Tulare will start in the low $200,000s. 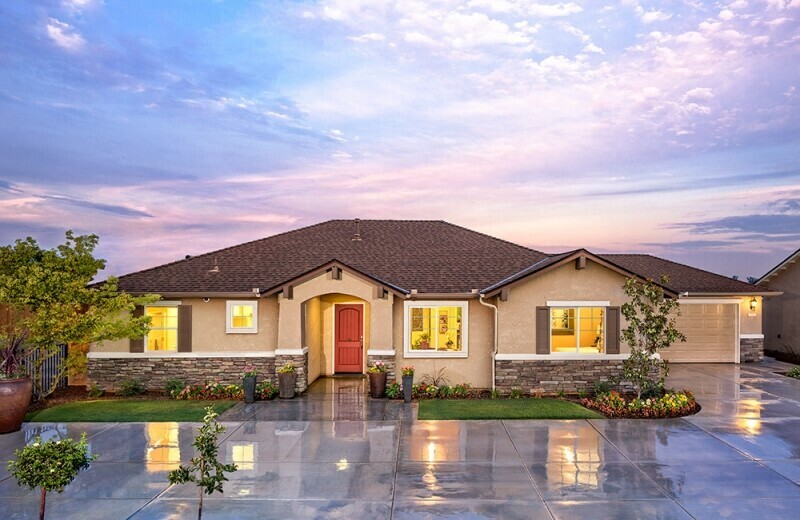 San Joaquin Valley Homes (SJV Homes) and Presidio Residential Capital plan to break ground this month at Kensington, a new residential community offering 134 detached single-family houses priced from the low $200,000s in Tulare in California’s Central Valley. The neighborhood is expected to be open for sale by Spring of 2019. The retail value of this project is estimated to exceed $33 million. Kensington will offer garden houses with three plans ranging from 1,297 – 1,597 square feet, all on lots averaging 6,000 square feet. The community will include a park and a pond. Located about one mile east of State Route 99, a Central Valley transportation corridor that connects Fresno to the north and Bakersfield to the south, Kensington is on Cartmill Street immediately west of Mooney Boulevard, next to SJV Homes’ sister community called Brighton in Visalia. The community is a 45-minute commute from Lemoore Naval Air Station and south Fresno. This is a joint venture project with Presidio Residential Capital, a San Diego-based real estate investment company that funds 100% of the projects and operations of SJV Homes. To date, SJV Homes and Presidio have partnered on 22 projects totaling more than 2,475 units. Founded in 2013 by Joe Leal, Jim Robinson and Randy Merrill, SJV Homes closed on its 1,000th home in September 2017, making it one of the region’s most active home builders. The Cambria subdivision will include “garden-style” homes in a semi-rural area of Porterville. Visalia-based San Joaquin Valley Homes announced it has closed on a deal for 15 acres of Porterville-area farmland to build an 80-home subdivision. The $18-million “Cambria” project will break ground this month on Henderson Avenue in Porterville with single-family homes ranging from 1,297 to 1,597 square feet with open floorplans, three bedrooms and two bathrooms on lots ranging from 4,750 to 5,840 square feet. It is the 21st joint venture project with lending partner Presidio Residential Capital, a San Diego-based real estate investment company that bankrolls the projects. Founded in 2013 by Joe Leal, Jim Robinson and Randy Merrill, SJV Homes has sold more than 1,000 homes, making it one of the most active homebuilders in the region, according to a news release. Acquires 15 acres of farmland and plans detached garden homes. San Joaquin Valley Homes (SJV Homes) and Presidio Residential Capital recently closed on 15 acres of farm land on Henderson Avenue in Porterville, California and plans to build Cambria, a new neighborhood with 80 single-family detached garden homes. The partners plan to break ground this month and will begin model construction in January 2019. The retail value of this project will exceed $18 million. Pricing was not disclosed. This is SJV Homes’ 21st joint venture project with Presidio Residential Capital, a San Diego-based real estate investment company that funds 100% of the projects and operations of SJV Homes.